Ah, we've reached the halfway point in the week now~ always such a relief! Although I must say these days have just been flying by~!! Many of you have your eyes set on Christmas and have been busy shopping I'm sure...me? I haven't started my shopping, but decorating began last night! Always love looking at lights again for the first time of the season :). I've also been busy making Christmas cards~! And today I have another set to share with you that I created for Webster's Pages, using yet again their endlessly beautiful "Royal Christmas" collection. When creating a card set, I like them to all have a uniform look, while being their own individual pieces. So for this set I chose a basic 6"x6" size, along with some of the beautiful Webster's Pages embellishments, stickers, and trim, and went to work. You can't get much more "royal" than purple and gold! This was the first card I created of the set, and I just knew I had to try out the bold purple found in this collection. 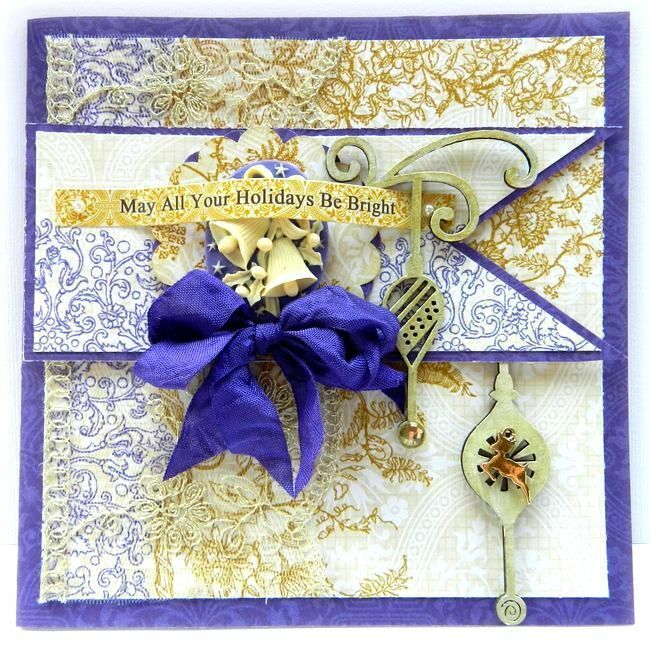 The gorgeous design found in the "Delights" paper worked perfectly for my background, and drew in both the gold and purple colors I was wanting to combine. I also just love the Webster's Pages cameos, including this "Blue Bell" piece! And sentiments are made easy by using the "Word Block Stickers", also available in this collection. Card #2 ended up being my favorite :). I just love the classic gold and red combo! 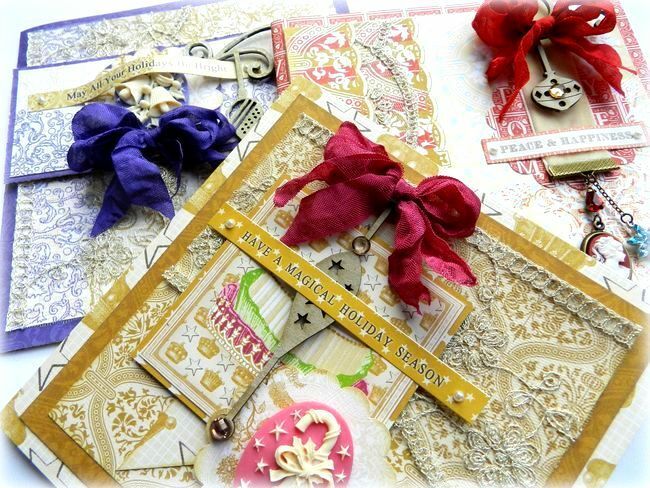 Some fussy cutting for some borders, paired with the "Lace Gold" trim to the left added some texture and interest to accompany the "highlight" of my card, which of course is my sentiment and StoryMarker. 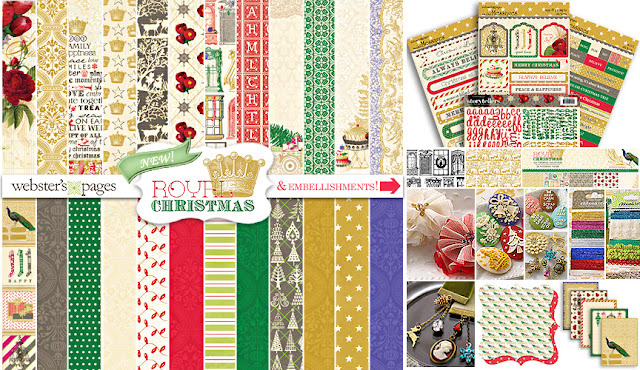 The "Royal Christmas" StoryMarkers are breathtaking, aren't they?? I just love the elegant detail they add! My final piece incorporated the subtle pink found in the collection, again with gold. I loved this "Pink Candy" Cameo and knew I just had to use it. So I paired it with the delicious treat motif from the "Greeting Cards" paper. Absolutely stunningly gorgeous cards! Webster's Pages makes my heart beat a little faster. Dine kort er fantastiske og fantasifulde, jeg er fuld af beundring, sådanne kan jeg slet ikke lave. knus morkaren. Wauw beautiful cards you have made. wow! those are so gorgeous, anyone who receives them will be getting a little gift, a piece of art for their home. I love how they are so dimensional...you'll have to mail those in padded envelopes! Absolutely amazing cards! You have used the silhouettes just beautifully! Oh, these cards are so gorgeous, Erin! Love those cameos and story markers. Awesome cards! 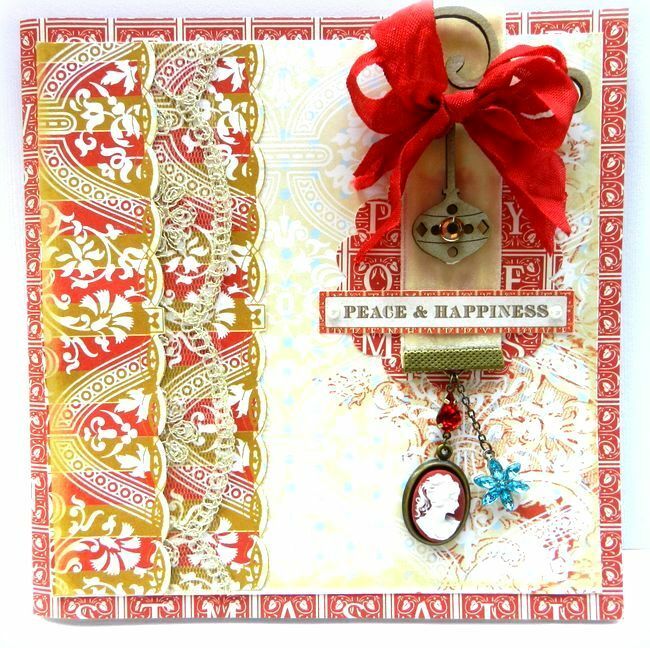 Love your layered and clusterd card style too!! All of them are gorgeous, but the purple one ... now that's something special ... and the cameo, is that what it is ... b.e.a.u.t.i.f.u.l.